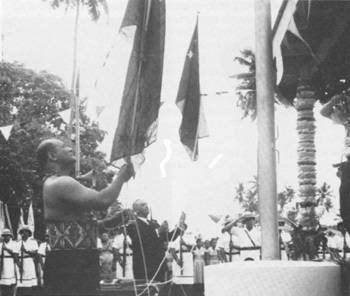 Co-Heads of State Tupua Tamasese Lealofi and Malietoa Tanumafili II raise Samoa's flag July 1, 1962 after achieving independence in January of the same year. I was not present that day, July 1 1962. I did not have the privilege of watching a flag being hoisted that same day to proclaim a country’s independence from foreign rule. There must have been fanfare, music and a grand celebration. I am sure that my forefathers who lived to see that day must have cried, along with thousands upon thousands of their countrymen. I was not present that day, July 1st, 1962 when Samoa’s flag was raised near that steps of the grand Fale Fono and a sovereign nation was born. But I did not need to be present that day to know the historical and life altering significance of that day and the days leading up to it. One only has to utter the names Olaf Friedrick Nelson, Namulau’ulu Lauaki Mamoe, Mata’afa Faumuina Fiame Mulinu’u and Malietoa Tanumafili II for Samoans to reflect on their collective past before silently uttering prayers of gratitude for their present and future. Imagine what it must be like for those who fought the valiant struggles of sovereignty, even for those who witnessed and supported from afar, when it was recently announced that one of Samoa’s relics, the Fale Fono would soon be demolished. Devastating. For those of us who were still too young to remember those struggles, but were old enough to walk through and marvel at its grand yet simplistic architecture and feel the palpable reverie of a bygone era it was soul stirring. Awe-inspiring. And for those who have not and may never have the opportunity to appreciate that place, you have our current Samoan government and officials to thank for this stroke of genius. Yes, I admit, I am a sentimental old fool, but it is old fools like me who believe that the past is the key to our future. This appears to be an all too common occurrence in a land where we have adopted the mantra, ‘If it’s not bigger/shinier it’s not better.’ This mentality in Samoa still strikes me as odd. Are we so determined to not be, look, or act Samoan that we will disfigure ourselves and demolish our past in order to conform to a Western standard that our forbearers tried so hard to avoid? In their haste to leave their own mark on history, Samoa’s government officials have conveniently forgotten another age old adage, ‘All that glitters is not gold.’ Is this a case of laziness or is that hallowed ground destined to be the new home of some gaudy casino, a high rise hotel or some other monstrosity that will ‘get in the way’ both literally and figuratively? Compare the sentiments of MP Aiafi to the entreaties of people like Lyvia Hansell Black and others like her (myself included) who believe that, “Once the building is gone it takes all its historical significance with it,” as she pleaded with government to reconsider their decision. 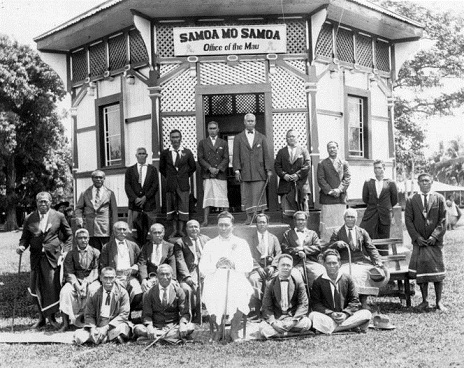 Tupua Tamasese Lealofi (seated in white) with Mau officers at Mau Headquaters, circa 1929. I hope it stays. Does it have to be demolished or can it be moved? I don’t know that it’s even been considered. The government has it’s mind set and they are going to carry it out. Sad for me but probably great for them. Let the ax fall?